I usually dont post UFOs but i thought I’d post this one. I havent had too much UFO this year and this one is really not too bad. Yeap! this is Vogue 1316 that I was obsessed with after seeing Carolyn’s version.I used all just scrape fabric since I wasnt sure if the colors will work out well. I actually stitches everything up really nicely – quite proud of the technical work I did here. However, the dress didnt work on me. I cut it out 2 size smaller based on some reviews I read – but I should have gone with my original size for this, as I can barely get into this dress. Also, its not very flattering to have the lighter pieces at the waist. I am not sure if I would try to remake this again, but if color inspiration ever strike again, I know what size to follow! On the other hand, thanks everyone who entered the give away! The winners had been contacted, please do enjoy your sweater! This entry was posted on Saturday, December 21st, 2013 at 11:43 pm	and posted in mistakes. You can follow any responses to this entry through the RSS 2.0 feed. UFO? Unfinished …? It looks really good on the hanger. Sorry it didn’t work out. 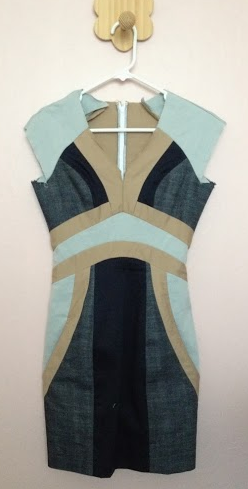 But you’ve gotta try it again cuz that idea of a color block dress is really really great! Besides you’ve been obsessing about it for so long. If only I fit into that dress, it’s gorgeous!! With Vogue’s love of 5/8 seams, are you sure you can’t let it out enough for you to wear it? Because it’s too pretty to go in the back of the closet or in the trash!! UFO ~ That’s a great term. I try not to have one in my sewing projects but have several in my knitting project stash….. The dress looks like a fun project to work on. I’m sorry that the size didn’t work out for you. That’s a bummer.